Save an extra CDN$ 14.05 (52%). Buy the Kindle Edition instead. Start reading Losing My Virginity on your Kindle in under a minute. 5.0 out of 5 starsOne of my favorite auto-bios EVER! OH MY GOODNESS!!! HOW COOL IS HE?!!?!? Losing My Virginity was an amazing ride!! WOW!! I read auto-bios once in a while, and I'm not a fan of fiction. This is in my Top 3 fav books! EVER!! Richard Branson really lays it out there! I truly appreciate the ups and downs and trying to catch up with all his adventures and projects! I will say that he jumps a lot from one topic to another very quickly. So you have to keep on track and know what he's talking about. It's a bit of a long read, but I really appreciated every page. I wouldn't remove a thing! I've always had an interest in the Virgin business. I figured getting this book would be a good way to learn more about it, how it got started etc. This turned out to be the best book I have read, or at least on par with my favourites. It's a long book but an easy read. It flows well from chapter to chapter. It's amazing to learn how Mr. Branson started out and what he developed in the end. It really goes to show it's impossible to predict how a small business will unfold over the long haul. The biggest lesson to take away from his success is be passionate. Do not chase money or prestige. That will come if you are passionate. Work for free if you have to, but wake up each day excited and the money will follow. I think this where 95% of us go wrong and why the other 5% have all the wealth. Think about it. Business school and more education makes you a good worker, but true success and happiness (which can bring tremendous wealth later on if that interests you) comes from passion, not getting more and more designations to get a small raise. This book will leave you highly inspired. I really wanted to like this book, but it moves so slowly and the author seems so to think that even mundane things that happen should be written about. It's the first book I couldn't finsh. So interesting to read about the humble beginnings of this superstar of the entrepreneurial world. Branson was not that familiar to me before reading the book, but I would pay a good amount of money to get the chance to talk to him now. Really fun to read and inspiring overall. Very insightful and inspiring. Would definitely recommend it to a young entrepreneurial soul.. or old one, its never too late. I enjoyed the first 80% of this book. 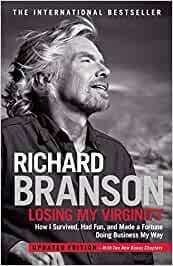 The last 200 pages or so rambled on and on but I’m still happy to have a better understand of Mr. Branson and his exciting life. 3.0 out of 5 starsMeh. 100 pages in, I sure hope the man is more interesting than the book. Kinda like Mr. Rogers narrating Star Wars.